Brava! for Women in the Arts Seeks Dynamic Leaders to Join our Board of Directors! When you support Brava, this happens! If you believe that the arts can transform the world and that diverse voices make us all better, please keep reading. We are looking for leaders who are willing and able to speak passionately about Brava! for Women in the Arts nonprofit. 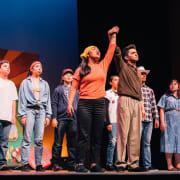 Share our story - as a place where rare art is presented on stage, divergent communities coalesce, and young people learn hard skills through our behind the scenes theater crew training. We are bringing on people who are willing to advocate within their own networks and invite new participants to Brava's mission. We are attracting leaders who want to ensure that Brava Theater and nonprofit have the funding and support to thrive as a place of community and art for generations to come. Brava! for Women and the Arts Board of Directors is the Leadership body of the organization responsible for ensuring financial stability and legal compliance. If you are interested in actively bringing new energy and resources to a beloved nonprofit theater in San Francisco's mission district, please reach out. 5hrs per month average. 8hrs per month upper.